Scotland’s favourite bigots are back in this hilarious new sequel to Des Dillon’s smash hit comedy, Singing I’m No A Billy He’s A Tim. Join Billy and Tim as they find themselves stuck in the medical room at Hampden Park during the Scottish Cup final between Rangers and Celtic after making a bet that backfires with spectacular consequences. Throw in a gallus wee Glaswegian ghost on a mission from God and a fierce Polish nurse with no time for nonsense and watch ninety minutes of outrageous comedy unfold. 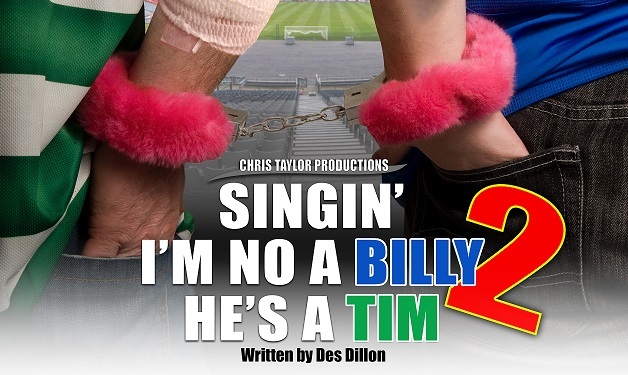 Singing I’m No A Billy He’s A Tim 2 will take you on a priceless comical journey like you’ve never witnessed before and promises to have you laughing so hard you’ll be begging for extra time.